I have a piece in Britain's Daily Telegraph newspaper today... on recent developments in border phlox (Phlox paniculata). You can read it here. You can read my piece about the new plants at the Chelsea Flower Show here. And see my full list of all the new plants unveiled at Chelsea here. 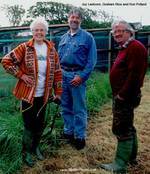 And my profile of the most influential writer on vegetables of our times - Joy Larkcom - is also available online. You can read it here. You can also read my choice of the Top Ten New Perennials selected for the Daily Telegraph here. Be sure to click on the In Pictures: Top 10 new perennials link at the top of the page to see a slide show of all ten of my picks. The Daily Telegraph is one of Britain's best-selling daily newspapers and winner of the 2007 Garden Media Guild award for the Gardening Newspaper of the Year. At the end of March I posted a link to my piece on the Top Ten New Perennials on the website of Britain’s Daily Telegraph newspaper. The article gives UK sources of these plants but I’ve been asked, in comments to the post and by email, for US sources. So here goes. Not all these plants may be new to the US, of course, and some have not yet crossed the water. I’ve added a few short quotes from my Telegraph piece. Don’t forget you can read the original piece here. Rather naughtily, I'm tempting you with pictures of two for which I cannot, yet, find US mail order sources! - Geranium pratense 'Laura' (above) and Sedum 'Marchant's Best Red' (below). Described by Sugar Creek Gardens website, but not yet for sale from them - or anyone else as far as I can see. No US source, yet, that I can find. 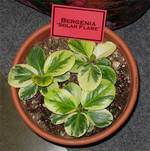 Please let me know if you find a mail order nursery selling this plant. Today (a day before it appears in print) my profile in the Daily Telegraph of the most influential writer on vegetables of our times - Joy Larkcom - is available online. You can read it here. You can also read my choice of the Top Ten New Perennials from last week's Daily Telegraph here. Be sure to click on the In Pictures: Top 10 new perennials link at the top of the page to see a slide show of all ten of my picks. Today, I have a piece on the Top Ten New Perennials in the Daily Telegraph.You can read it here. Be sure to click on the In Pictures: Top 10 new perennials link at the top of the page to see a slide show of all ten of my picks. This is just to say that you can read my article on Clematis cirrhosa in today's Daily Telegraph here. And my piece on winter flowering pansies here. And another piece, on growing your own mistletoe, here. The Daily Telegraph is one of Britain's best-selling daily newspapers and winners of the 2007 award for the Gardening Newspaper of the Year. This is just to day that you can read my article on hellebores in today's Daily Telegraph. The Daily Telegraph is one of Britain's best-selling daily newspapers. Read it here. This is just to day that you can read my article on arums for winter foliage in today's Daily Telegraph. The Daily Telegraph is one of Britain's best-selling daily newspapers. Read it here. And my piece for them on winter flowering pansies here. This is just to day that you can read my article on bergenias in today's Daily Telegraph. The Daily Telegraph is one of Britain's best-selling daily newspapers. Read it here. You can also read my earlier piece for them on winter flowering pansies here. This is just to day that you can read my article on winter flowering pansies (winter flowering in Britain, and zone 7 and 8 in North America, that is) in today's Daily Telegraph. The Daily Telegraph is one of Britain's best-selling daily newspapers. Read it here. You can also read my earlier piece for them, on growing your own mistletoe, here. Well, the season to be jolly approaches – though quite why we can’t be jolly all the year round I’m not sure… anyway… - with mistletoe soon to be hanging over our heads and a jolly kiss on our minds I thought I’d share this picture and point you to my article on mistletoe in today’s Daily Telegraph newspaper back in England. This picture of the European mistletoe was taken back in England, in Northamptonshire. It’s a partially parasitic plan which attaches itself to a host plant from which it takes nutrients. 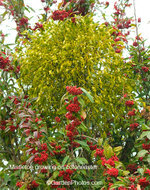 Here, a fat clump of mistletoe is growing on a 12ft/3m cotoneaster in a shrub border and looks wonderful amongst all those red berries. Although apple trees are the favorites hosts, mistletoe turns up on a wide variety of other trees and large shrubs especially those in the rose family. You can read more about mistletoe, and even how to grow it yourself from berries, in my article in today’s Daily Telegraph.